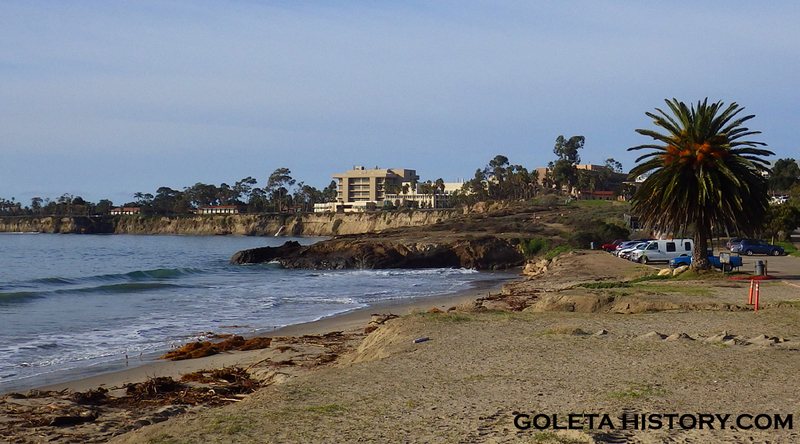 Next time you’re at Goleta Beach, look towards UCSB and notice the dark rock formation at the base of the bluffs. This lovely location once was the scene of blood and carnage, all in the name of commerce. A shore whaling station was located here for about twenty years starting in 1870 to help provide Americans with whale oil for heating and lamps. If you think oil derricks are ugly, this will blow your mind. 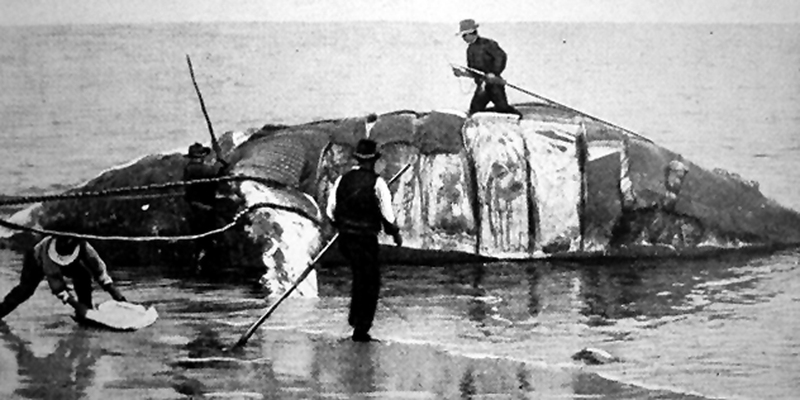 Whaling was a disgusting and messy process, and there were no rules or regulations about how it was done. Since only the outer layer of fat was what they could sell, the rest of the gigantic mammal was left to rot right there on the beach. Blood, guts and bones were washing around in the breakers for weeks, or until the tide was high enough to carry it all out to sea. The stench was unbearable as the meat slowly decayed on the beach and in the shallows, much to the enjoyment of the seabirds and the sharks. Meanwhile, the oak groves of Isla Vista were decimated to provide firewood for the “try-pots” that melted the whale fat down into oil, and you can imagine the air quality from all that melting fat! Overall, a very destructive method to obtain oil. Goleta was just one of many shore whaling stations in California in the second half of the 1800’s. It became popular with experienced whalers because it afforded them the opportunity to live on shore with their families and still make a living in the whaling business. The spring and winter migrations provided a relatively easy source of income for them. 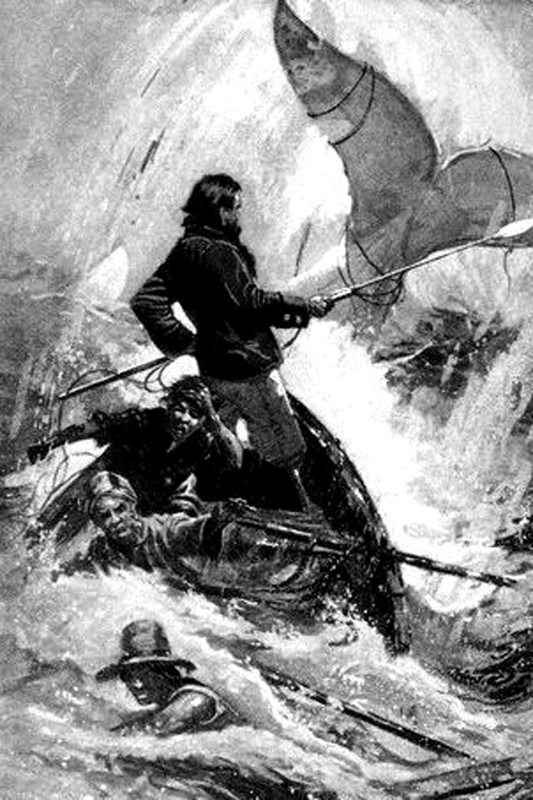 The whales were killed with the use of a skiff that had a sail, a harpoon and was manned by six men. 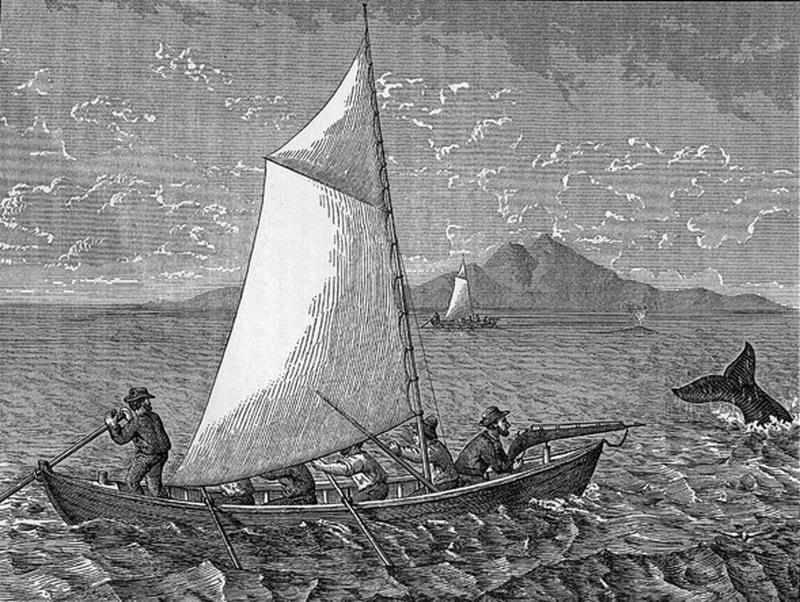 The Goleta company hunted gray whales from December to April using three of these boats, which were not originally designed for whaling and were in poor condition. Shore whaling was a deadly battle between 200 pound men in a battered wood plank skiff and 30 ton monsters. 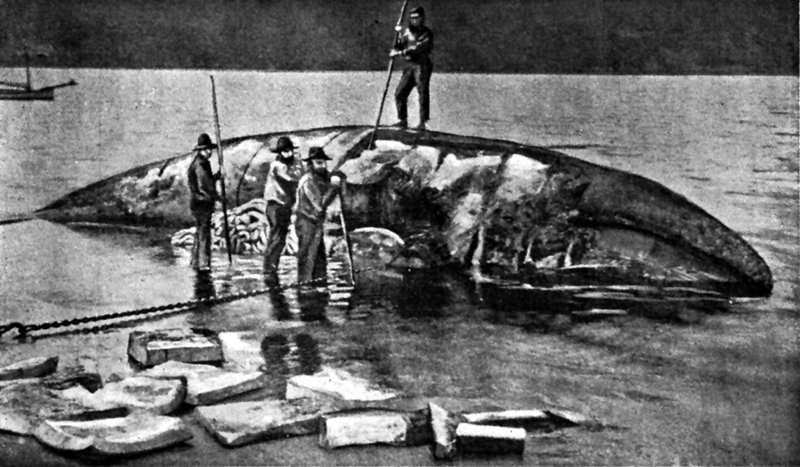 The crew used the harpoon and a coil of hemp rope to lash themselves to sometimes 45-foot long whales. The harpoon was fired by a Greener’s gun and the instant it struck, the whale thrashed wildly, sometimes smashing the boat to pieces. Once the whale was harpooned, the skiff would pull up to it and a bomb lance was thrust into the massive prey. The explosion would usually kill the whale. 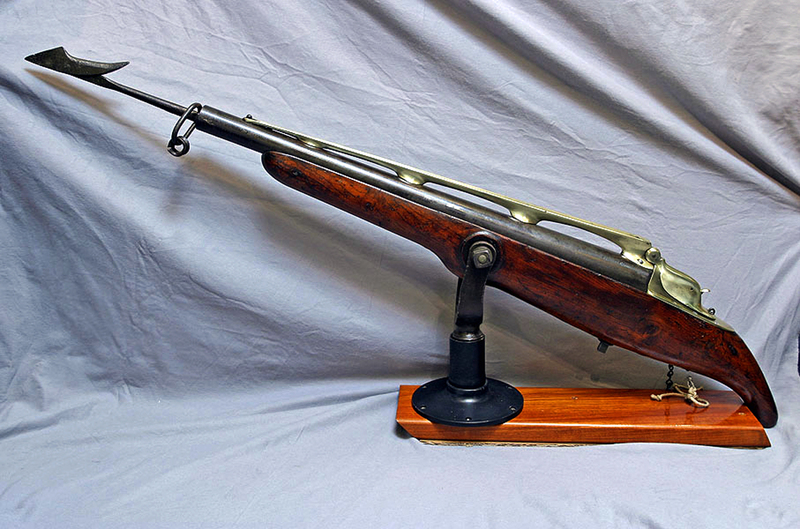 Some men badly injured themselves or died from self-inflicted wounds suffered while loading and handling these guns during the hunt. Newspaper reports tell graphic stories of men shooting themselves through the head while attempting to load the weapons at sea. A veteran whaler described it as “uncontrollable terror” when the skiff approached a whale just before the attack. The crew moved carefully into range and the harpoon was shot into the whale, followed by an intense battle in which the whale or the men could be killed. 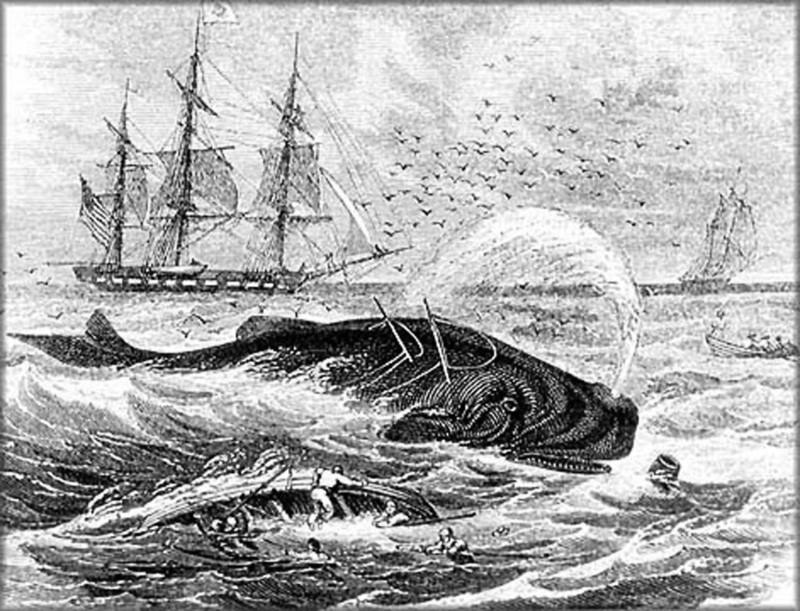 One whaler described gray whales as “almost sure death to hunt.” He told of “a good many graves alongshore of men who had been killed by those whales.” Gray whales became known as “devil fish” due to their fierce nature when hunted. Sometimes the whales bolted, pulling the boat forward with a tremendous jerk and up to speeds topping 20 miles an hour, putting the small boat to a test as it was dragged rapidly through the chop. The whaling crews typically stayed within ten miles of shore, but some whales fought for hours and pulled the boats far out to sea. Once the whale was killed it was then towed to shore, where it was cut up and the blubber was removed. The yellowish chunks of greasy fat were carried up to the try pots to be melted down into whale oil, sending thick clouds of sooty black smoke into the air. 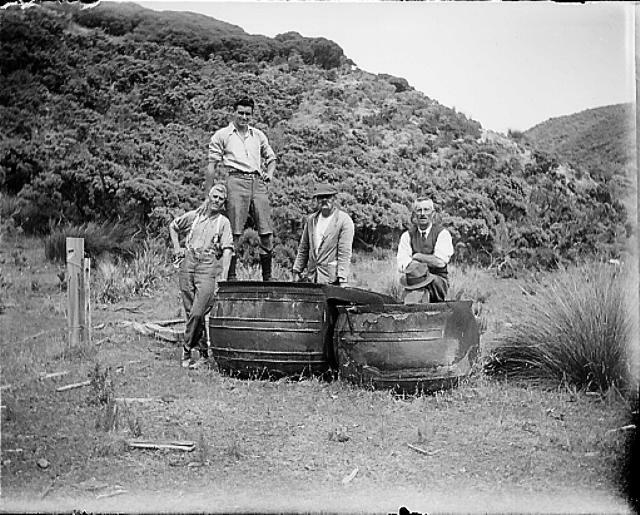 Up to 450 barrels of the finished product were shipped out on coastal schooners each season, providing oil for heating and lamps to happy consumers. In 1874 More’s Landing was constructed about a quarter mile to the east, making it much easier to cart the barrels from shore to ship. 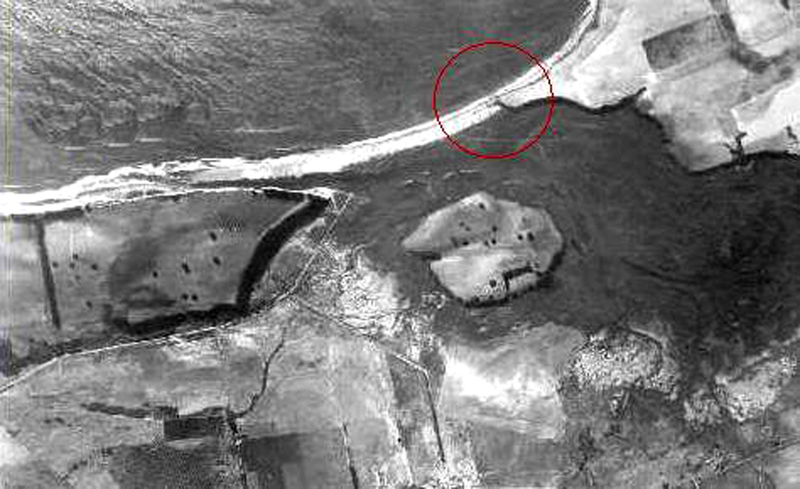 The men lived in shanties on the west end of what we now call Goleta Beach, shown circled above. 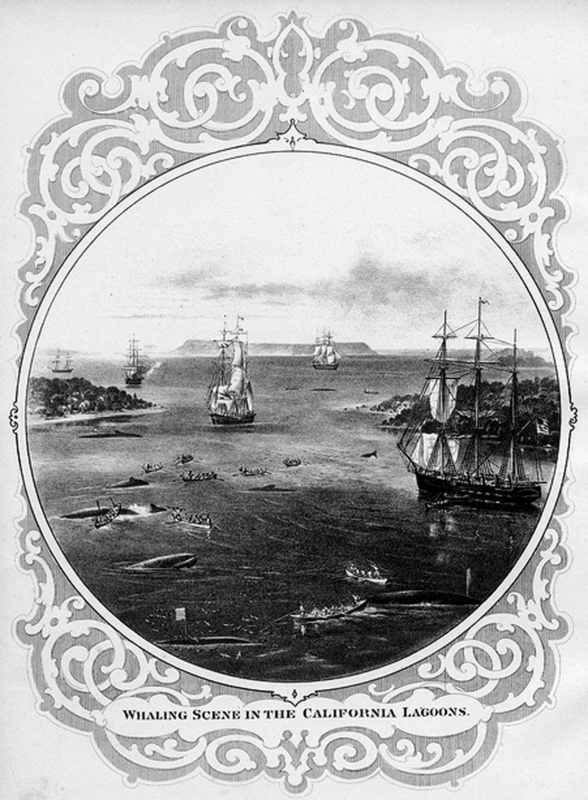 Six Jamaican sailors and a Chinese cook were commanded by Captain Von Doress, the owner of the company, who was originally from Connecticut. 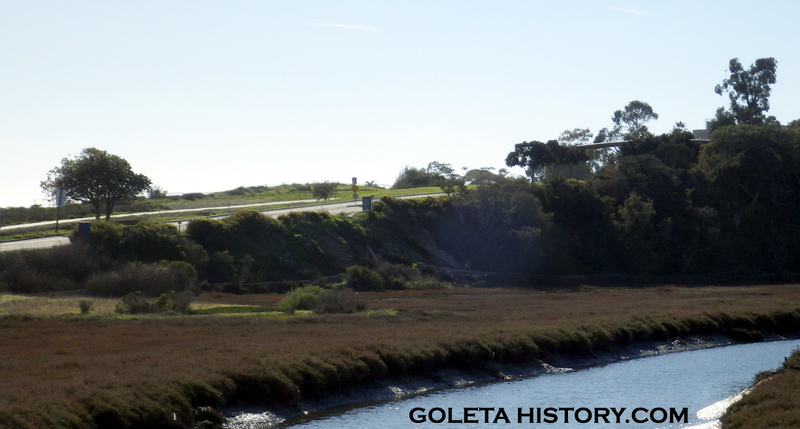 The bluffs at the west end of Goleta Beach were still stained with the soot of the whaling camp fires until 1963, when they built Ward Memorial Boulevard and the area was buried with fill dirt and paved over. 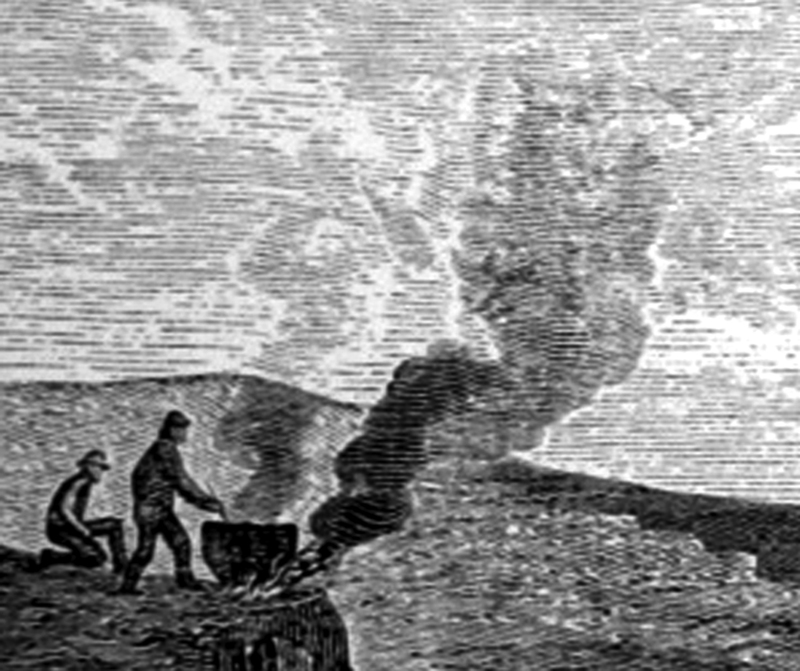 By the end of the century, coal and electricity were becoming more widely used and the whale population was in rapid decline due to excessive hunting. The aggressive pursuit of whales up and down the California coast, including the discovery of their breeding grounds in Baja California, devastated the gray whale population. The constant harassment of the remaining population began to alter their behavior. They became skittish and much harder to hunt, staying further offshore out of reach of beach based hunters. 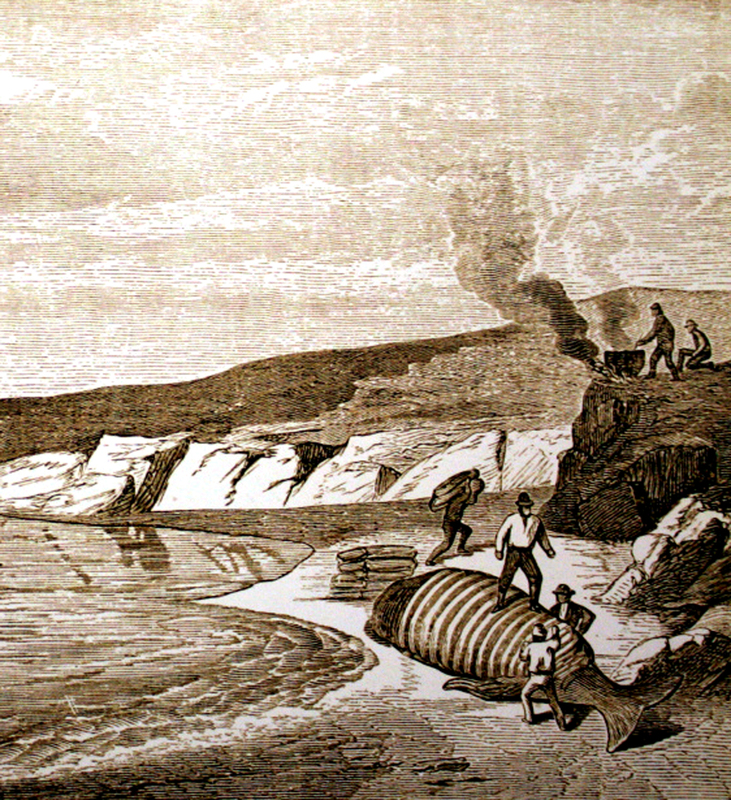 Shore whaling became less profitable and more difficult, so the whaling station at Goleta was eventually abandoned. You do a great job with your local research. Thanks for sharing. I just read the Goleta whaling piece on edhat. Um, I guess we DO need some environmental protections! Thanks for this, Tom. Interesting and informative. After we get the Barnsdall station preserved, let’s see if we can figure out a way to get a whaling exhibit at Stow House. Thank you Jim, that’s a great idea! Fun to read this history! Are you related to Janet and Suzie Modugno?